The discovery of DNA was one of the great triumphs of science. But ever since this discovery there has been a strange trend which we may call “DNA inflation” or “DNA exaggeration.” The trend has been to carelessly describe DNA in ever more grandiose terms, regardless of the actual facts. One very common claim is that DNA is a blueprint that lays out the complete specification of the human body. Another common claim is that DNA is a recipe (or a library of recipes) for making an organism. It is also sometimes claimed that DNA is like a computer program for generating our bodies. But such statements are not warranted by the facts. Judging from the facts, we must conclude that while DNA uses a code of symbolic representations (the genetic code), DNA is not a blueprint for making a human, is not a recipe for making a human, and is not a program or algorithm for making a human. The facts indicate that DNA is not anything close to a complete specification of an organism, but that DNA is instead something much simpler, mainly just a kind of database (or a collection of ingredient lists) used in making particular parts of an organism. To get an idea of the true nature of DNA, it is a good idea to adopt a conceptual model of DNA. In science, a model is a somewhat simplified representation that helps us understand a more complicated reality. A classic example of a model is the Bohr model of the atom, in which the nucleus of an atom is compared to the sun, and the electrons in an atom are compared to planets that revolve around the sun. The atom is actually more complicated than such a situation (given the weirdness of quantum mechanics), but the Bohr model is still useful to help us get a basic grasp of what an atom is like. The Bohr model is essentially accurate, because just as the great majority of a solar system's mass exists at its center in the sun, the great majority of an atom's mass exists at its center in the atomic nucleus. Now, what model can we use to grasp the basic nature of DNA? A good model to use is what we may call the chain-of-colored-beads model. Let us imagine a long chain of colored beads, in which there are about twenty possible bead colors, and each bead stands for a particular type of chemical called an amino acid. That is exactly how DNA works. We can imagine that one of these colors means kind of “Start.” The amino acids are the constituents of proteins. So after one of these “Start” beads appears in the chain, there is then a sequence of colored beads, with each color representing one of the twenty amino acids. Altogether the long “chain of beads” that is DNA specifies the ingredients of thousands of different proteins. A particular snippet or section of DNA will correspond to a chain of amino acids that is the starting point of a protein. The visual below illustrates this schematically. Now, once we have adopted this useful “chain of colored beads” model to help us understand the nature of DNA, we can understand the limitations of DNA. What type of information can be specified with such a “chain of colored beads”? Only simple linear information, what is called one-dimensional information. As two scientists state, "Genes are merely a means of specifying polypeptides," the one-dimensional chains like those depicted above. An example of one-dimensional information is a telephone number, a social security number, or a stock ticker tape. Such information can always be presented with a single line or row, although some types of one-dimensional information might require a long line or row. A more complicated type of information is what is called two-dimensional information. Such information requires both rows and columns. An example of two-dimensional information is the information in a calendar or a spreadsheet. 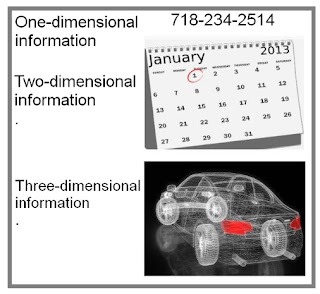 Another more complicated type of information is called three-dimensional information. Three-dimensional information specifies something that can only be described using the dimensions of length, width, and depth. An example is the information specifying the three-dimensional structure of a car. Now, what type of information would be required to specify the physical layout of a three-dimensional body such as the human body? To specify such a thing, you would need three-dimensional information, information involving length, width and depth. But there is no way that such three-dimensional information could exist in DNA, which has merely one-dimensional information. In fact, it seems that in order to make a complete biological specification of an organism, you would need not just three-dimensional information, but four-dimensional information. Time is often regarded as the fourth dimension. We can describe four-dimensional information as information that involves not merely aspects of length, width, and depth, but also an aspect of time. Why would you need four-dimensional information to specify an organism such as a human? For one thing, it is not true that humans just pop into existence as adults. Instead, there is a long series of transitions between the earliest state of a newly fertilized egg, and that of a full-grown human. A full human specification would have to specify each of these states. So the specification would need to use the fourth dimension of time to specify this temporal progression in human forms. Another reason why a full human specification would need to be four-dimensional is that human beings are not static objects, but intensely dynamic objects. Think of all the dynamic activity occurring every day in your body. Blood and electricity is flowing about, proteins are being synthesized according to specific time tables, cells are being born and dying according to other time tables, and so forth. A single snapshot of the state of a human body is not at all sufficient to capture this dynamic activity. You would need to have a specification that is four-dimensional. Similarly, if someone from some small island in the Pacific had no idea of what a city was, you would never specify what a city was by just showing some maps. You would need to somehow specify the motion occurring in the city: the subways moving, the cars moving, the people moving, the water flowing through pipes, and so forth. But DNA can only specify one-dimensional information. So it is very absurd to maintain that a biological specification of humans is in the one-dimensional information of DNA. The table below lists on the left various types of information that would be needed to have a full biological specification of an organism, and on the right whether or not such information can be specified in DNA. Type of information Can it be specified in DNA? Some would disagree about the answer I have given in the third row, and claim that the three-dimensional shape of a protein molecule is purely a consequence of its sequence of amino acids. 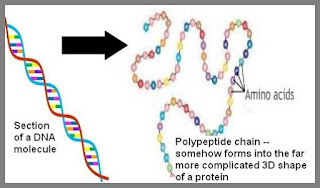 If this were true, scientists would have long ago solved the protein folding problem, and would be able to predict the three-dimensional shapes of proteins from their one-dimensional sequence of amino acids. But after decades of trying to do this, the protein-folding problem is still unsolved, and (as discussed here) scientists still cannot accurately predict the 3D shapes of large proteins from their amino acid sequences. The fact that DNA can only store one-dimensional information is a decisive reason for rejecting all claims that DNA even half-specifies the human organism. There are two other reasons for rejecting such claims. The first is that no one has found any information in DNA corresponding to human body plan information. The human genome has been thoroughly studied through massive projects such as the Human Genome Project and the ENCODE project. No one has found any gene information specifying a human body plan, a structural plan for a cell, a structural plan for an organ, or a structural plan for an organ system. The second reason is equally enormous. It is simply that there exists nothing in the human body that could interpret a specification of human biology, if such a thing existed in DNA. Consider computer code. Such code can only work because there is an enormously sophisticated piece of software called an interpreter or compiler that is smart enough to read such complex instructions. If it were to happen that DNA stored instructions for making a human, contrary to the evidence, we would only explain human development if we imagined that somewhere in our biology was some enormously sophisticated machinery or functionality capable of reading such highly complex instructions and executing them. But no such functionality has ever been discovered. Is it accurate to say that there are recipes in DNA? No it is not. A recipe includes an ingredient list, and a set of instructions explaining how to make a particular meal or dish using those ingredients. DNA has lots of ingredient lists specifying the ingredients of proteins. But nowhere does DNA specify a series of instructions for assembling a protein molecule, a cell, an organ, an organ system, or a full body. Protein molecules have three-dimensional shapes that they assume for unknown reasons. Such shapes are not specified in DNA. At the end of this post (in which I cite additional very weighty reasons for rejecting the claim the DNA is a specification of a human), I quote eight different scientists (mainly biologists) who state that DNA is not a recipe or blueprint for making a human, or anything like a specification of the human form. So where is it that biological shapes and structures come from? This is a gigantic unknown, which stands as a dramatic contradiction of all attempts to explain biology in mechanistic or materialistic terms. We do not know where the 3D shapes of protein molecules come from. We do not know where the shapes of cells come from. We do not know where the structure of tissues comes from. We do not know where the shapes of organs come from. We do not know where the shapes of organ systems come from. We do not know where the overall body plan of an organism comes from. We therefore have a strong reason to suspect that such things are mysterious inputs from some unfathomable reality outside of an organism. At the beginning of the 21st century, biology confronted an uncomfortable fact: despite the increasing availability of whole genome sequence data, it was not possible to predict, or even clarify, phenotypic observations. In fact, we now know that there is not sufficient information in the linear DNA of the complete genomes to recover and/or understand the diverse phenotypic states of an organism. In statements such as this, scientists "fess up" that the idea of DNA as a human specification is not true.